This post is a sponsored collaboration between Kimpton Donovan Hotel and Danay.net. All opinions expressed are my own. 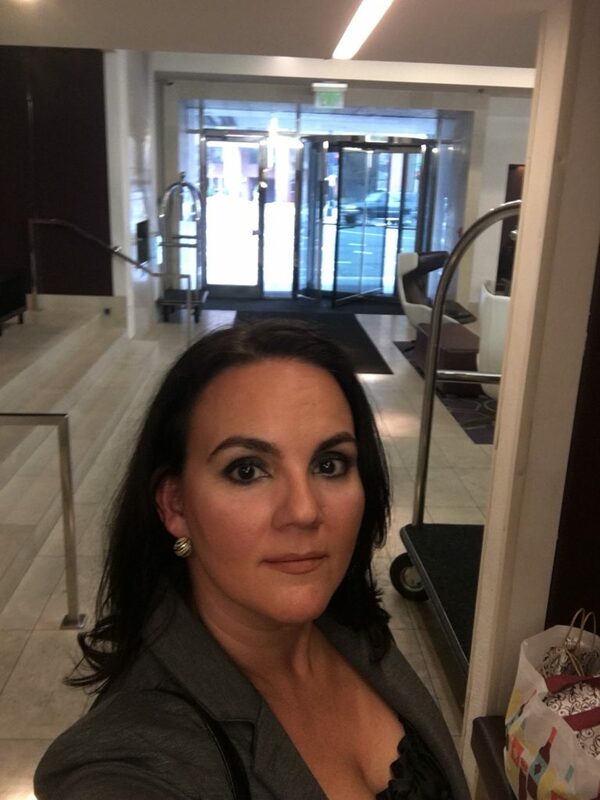 When I arrived at 5:15 PM at the hotel for my first Latina Meetup in D.C. I was delighted to see the guests lounging in the lobby with glasses of wine in their hands. This is thanks to the hosted complimentary wine hour from 5 to 6 PM, 7 days per week. You had me at complimentary wine hour. I left my husband and son to check-in and proceeded to join the fun. A few minutes later, after a dropping off Mr. Teenybopper in the room, hubby and I returned to the lobby to enjoy the wine hour. Not only is this a great little luxury for the guests, but it’s also a wonderful way to meet others. And we LOVE meeting new people. We stayed in the Double Double Executive. The room had a fun, contemporary style that departs from the IMHO boring federal type decor of many area hotels. The floor-to-ceiling windows provided a perfect view of the city where I was able to enjoy my morning worship of the sunrise. It’s one of the perks of being an early riser. The room included a well stocked mini bar, a nice over-sized oak table to work on, one of the coolest spiral walk-in showers I’ve ever used and a massive LCD flat-screen TV which the teenybopper made good use of. The spacious bathroom was well stocked with towels and luxury Atelier Bloem bath amenities. A Keurig with a selection of coffee was another perfect addition. It’s as if someone asked me for my favorite staples when setting up the room. It’s worth noting that complimentary bath robes, an umbrella and a yoga mat are included in every room. Just check the closet. I had a lot of planning and catching up to do to make sure my event went off without a hitch. It was going to be a room service kind of night. 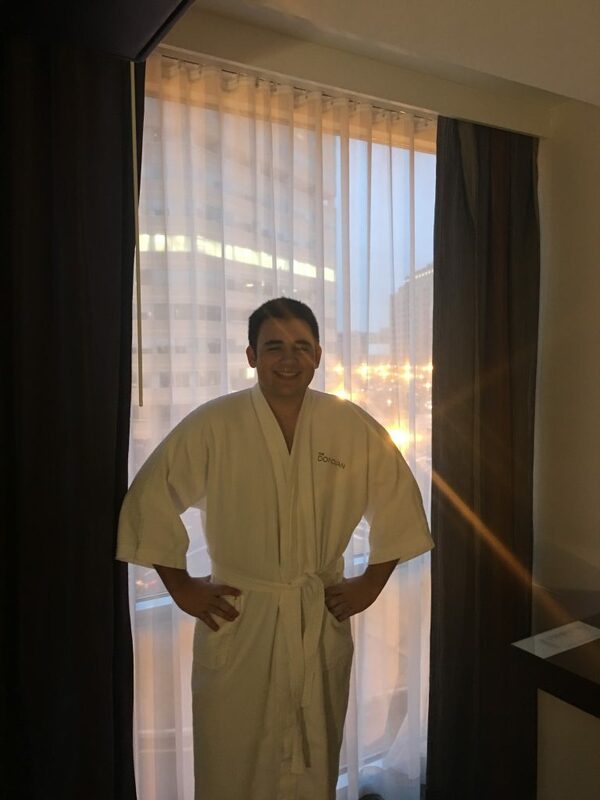 I jumped in the shower, slipped into the complimentary robe and ordered from Zentan, the in-house restaurant. I could have ordered one of everything from the Zentan menu. I’m going to need to set aside some time to thoroughly enjoy more of their mouthwatering Asian fusion yumminess during my next visit. 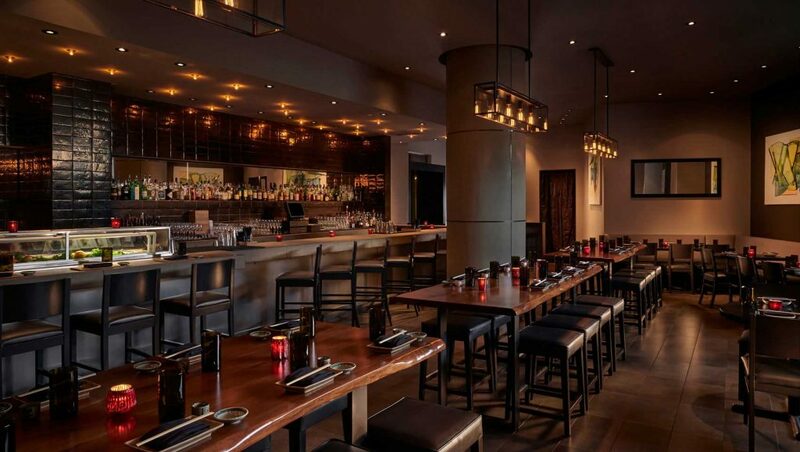 It really is a destination all on its own with its communal table and custom-built robata grill. Of course, I wasn’t the only one who got to enjoy the luxe robes. Aiden enjoying the perks of traveling with Mami. After recharging the batteries with some amazing food, I was able to hammer out some last minute work before calling it a night. 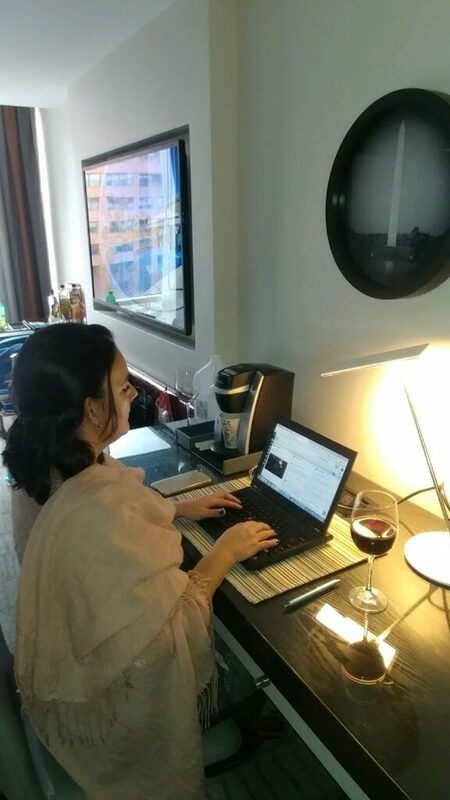 I loved having a large desk for my work area to finish some last minute work while enjoying a glass of wine. 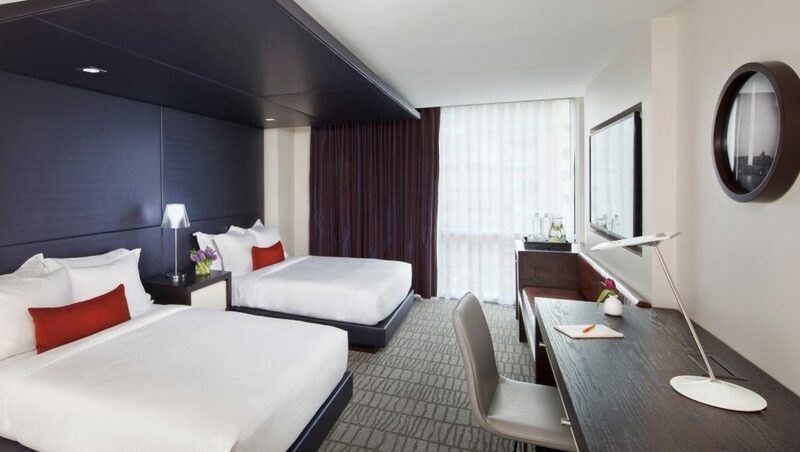 The Kimpton Donovan is perfectly situated just off Thomas Circle in Downtown D.C. For those of us who prefer walking to the White House or the National Mall, the location is perfect. Most of the popular museums are within a mile walking distance. It’s basically close to EVERYTHING! 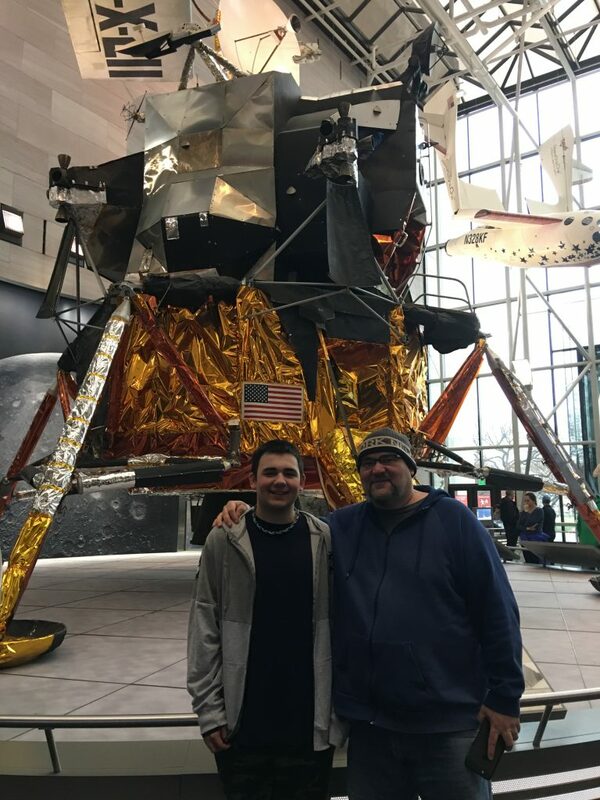 There was very little time to do any sightseeing on this trip, but my husband had been wanting to go t the Smithsonian National Air & Space Museum since he was a little kid. 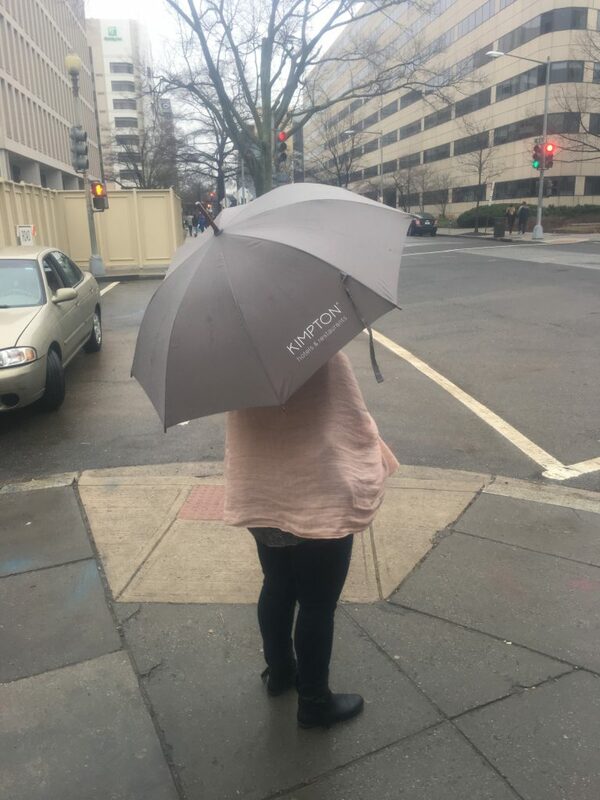 Even though the weather was grey and miserable, we grabbed our complimentary umbrella and headed out for a quick visit. That umbrella came in handy. Another thing I am keenly aware of when I stay in a hotel is the level of customer service. You can tell a lot about a hotel’s culture from the staff’s demeanor. Every interaction with the staff, whether it was the valet, the front desk or housekeeping was perfection. I’m usually a very low maintenance guest, but this time I knew I would be the opposite. I had a lot going on with the planning and finalizing for the event. There were about 13 boxes that arrived during my stay. Every time a shipment came in I received a call and the box was promptly brought to my room. Knowing that I was in very gracious and capable hands with my stay was an absolute joy . 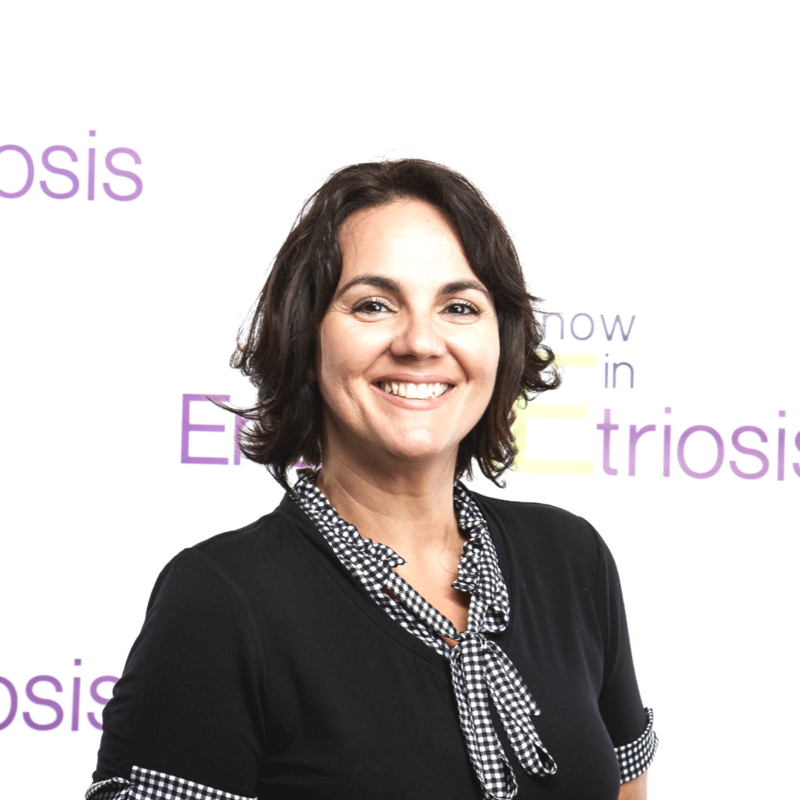 It allowed me to focus on ensuring a fabulous event while the fam enjoyed our stay. Relaxed and heading to my event thanks to a worry-free stay. While I am not a fan of working out indoors and prefer running outside, I did appreciate the 24-hour gym. When the weather is cold and rainy and you want to avoid getting sick, hitting the treadmill is a plus. Spa services including massages, body treatments, and facials can all be reserved and enjoyed in the privacy of your room. If you are an IHG® Rewards Club member, you get a $30 credit toward your in-room spa service. If you’re not a member but would like to sign up, click here. As a business traveler, it’s important for me that a hotel has business-friendly amenities and services. The Kimpton Donovan did not disappoint. There are two rooms for meetings which can be combined for a total of 1,325 square feet of event space that can accommodate up to 80 guests. The rooftop is also available with room for up to 100 guests. 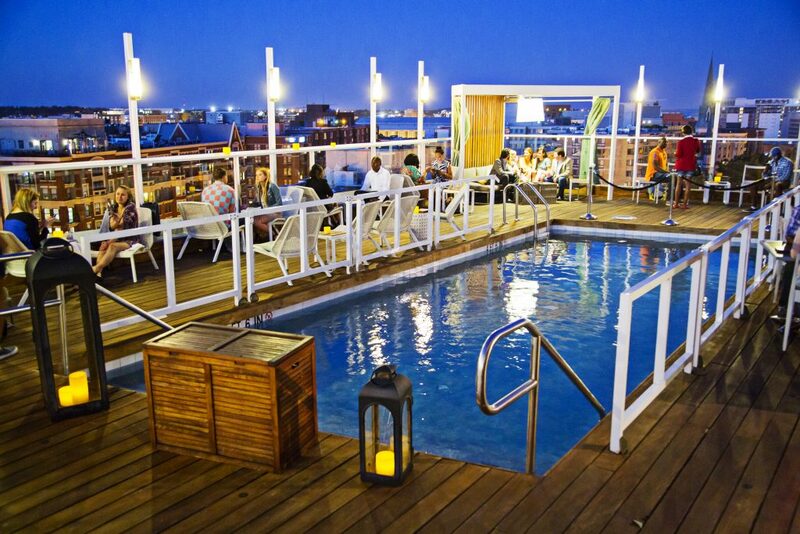 I’ll be looking at hosting one of my Latina Meetup events on the rooftop later this year. Here are some of the business traveler -friendly services that I really dig. Another thing I loved about the Donovan was running into some of the furry guests. The hotel is very pet friendly and the only requirement is filling out a pet form during registration. I will certainly be back with our boxer during my next stay. He’d love to make some friends. I was bummed out that the gorgeous DNV Rooftop Lounge was closed for the season. It is open from Memorial Day through Labor Day. 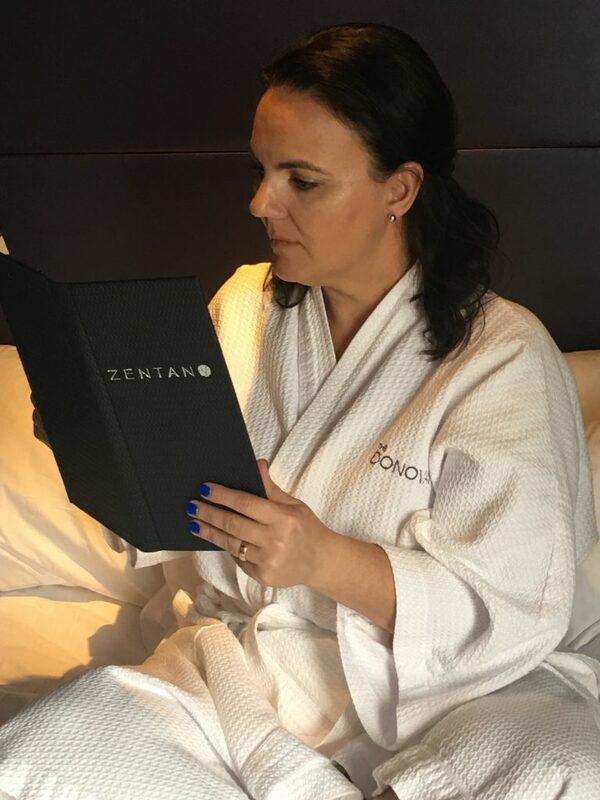 I’ve heard it’s a must-see with stunning views of D.C.
Hotel guests can enjoy snacks and drinks from Zentan during the day. After 5PM, it transforms into a trendy evening hot spot. Check out some of the other fab amenities you’ll get during your stay. Since I travel a lot with my family, I’m always looking for hotels that have the perfect mix of family-friendly and business amenities. The Kimpton Donovan hotel really exceeded my expectations on the business end. As for family, I can say that my teen son was impressed with the room, huge TV, amenities and luxury. Points scored by mom for the coolness factor! I really wish I had more time to visit Zentan Restaurant and enjoy the spa services, but I’ll just have to save that for my next visit. If you’re hitting D.C., you should definitely treat yourself to an upscale boutique property with a great location, a plethora of amenities and some of the area’s best dining. Check them out and book your room today. Don’t be surprised if we bump into each other during wine hour! What are your must-haves at a hotel when traveling for business or pleasure? That sounds like an amazing hotel. I have family in the area, so I have never stayed at a hotel in the DC area, but if I ever do – this will be it. Their amenities is impressive and it’s nice they even have 24 hours gym. I would have also enjoyed the complimentary wine hour. This looks like a wonderful hotel! I’ve always wanted to go to Washington DC. I’ll keep this hotel in mind when we do go. We want to check out all those museums. We took a trip to DC a couple of years go and loved it. I love it when there’s a Keurig coffee maker in the room, so convenient for us coffee lovers that want it often. You’re speaking my language. My love of coffee runs deep, so I can totally appreciate when there is an abundance of it. My husband travels all the time for business, every week as a matter of fact. Sometimes I get to go along and enjoy some great hotels just like this one. Nice to feel very pampered and taken care of with all the wonderful things they provide. Kimpton is one of my fave spots to stay. I didn’t know there was one near the Smithsonians so I’ll definitely have to check it out next time we’re in D.C. Oh yeah and about that complimentary wine hour. Yes, please. Yes, I believe they have about 10 properties in DC. It really is a great brand. Sounds like it was a great visit. I love that they have a wine hour so you could mingle and meet some new people. And those windows in the room were amazing. Yes, the wine hour was a definite plus. Thanks for dropping in Lisa! This looks like an amazing hotel to stay at. Love the decor of the room and style of the hotel. I also, love that they have complimentary wine. Sounds like a great place to spend your vacation in especially since they have so much to offer. I think I’ll have a great time with the Spa and the restaurant. This hotel looks really impressive. I love all the amenities. 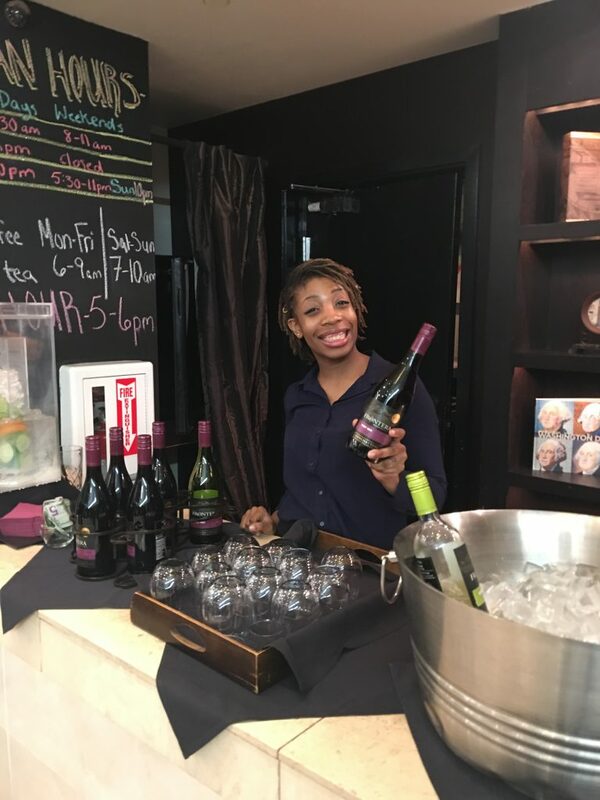 A special wine hour sounds like a lovely way to unwind! This looks and sounds like a wonderful hotel. I would love to visit it someday. I have not been to D.C. in years. Would make for anice get away with my husband. Complimentary wine happy hour? Yeeeessss. Sign me up too! The hotel looks amazing! Love D.C. in general, so, may have to check them out! I love DC too. Thanks Jacqui! It’s such a beautiful experience altogether. I think this place is amazing especially with the beautiful rooms, amenities, and good food. It’s definitely a great place for a weekend getaway! I think I’m truly in love. This places is AMAZING and definitely my speed. The perfect getaway! You are right it is genuine customer service with a personal touch that always sets apart the best of hotels from the good. Facilities can be replicated but what cannot be replicated is genuine service. This hotel surely seems to offer great service in addition to all amenities. It’s been a three long years since we went to Washington DC. My husband and I been planning to go visit again over the weekend. This hotel looks so luxurious (in my opinion) I love how decorated the room you stayed at . The complimentary drinks is a plus! I love that the hotel had a 24 hour business centre which is an ideal hub for business travelers like yourself. And I am so glad that the hotel had excellent customer service and was committed to ensuring that their guests had the best time! I do too, it’s a huge thing for me. I want to be able to take care of any last-minute needs without having to run out.